The exquisite 5 Star Crystal Aura Beach Resort & Spa is located on its own private golden beach in the popular resort of Kemer resort on the beautiful Turkish Riviera.Situated at the point where the Taurus Mountains plunge into the beautiful turquoise Mediterranean Sea, the hotel is near to the village centre and 38 km from Antalya City. Offering an Ultimate All Inclusive concept, this fabulous 5 Star hotel is the perfect retreat for couples and families with 366 attractive guestrooms and suites with ultra-modern amenities including a wide range of food and drinks for 24 hours, plenty of leisure activities, relaxing SPA treatments, and excellent service. Guests to the Crystal Aura Beach Resort & Spa can discover marvellous beaches, explore delightful villages and historical sites nearby, and experience real Turkish hospitality. Getting to the hotel: Antalya Airport is 55 km from the hotel. Local Tips: Kemer is a pivotal spot for enjoying the best of Turkey. Your vacation will be enriched by idyllic views of seacoasts, historical ruins and a lot of happening markets and clubs. Food, drink and entertainment: The Hotel is booked as Ultimate All Inclusive accommodation with five restaurants, a patisserie, snack bar, and cafeteria. There are four bars. The Crystal Aura Beach Resort & Spa operates on an “Ultimate All Inclusive” basis which includes soft and local alcoholic drinks. A buffet breakfast is served and lunch is available as a buffet or can be selected from menu options. Dinner can be enjoyed buffet-style, taken a la carte or selected from menu options. Guests enjoy evening shows, live music (on certain days of the week) and disco. 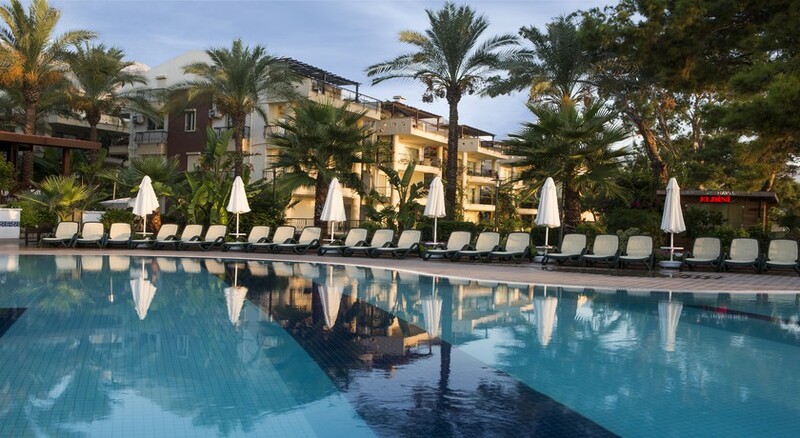 Sports, games and activities: The hotel is a paradise for families with children offering a private fine sandy beach of 50 metres length and 100 metres width along with a variety of pools and aquaparks. Animation activities for adults and children with Kids Club, children's playground and pool. Facilities with local charge include watersports, bowling, tennis equipment and lighting, Billiards, SPA Centre, and massage services. Additional: 24-hour reception with sophisticated multilingual staff, check out services, currency exchange, hotel safe, Internet access (with charge), 220 V, cloakroom and lift access, conference facilities with 2 meeting rooms, fully air conditioned, laundry facilities, hairdresser, newspaper stand, parking and medical assistance. Rooms for guests with disabilities are available. Honeymoon VIP treatment with fruit basket. Facilities with local charge include hairdresser, shopping centre, doctor, dry cleaning and laundry, internet in room and babysitting. The Crystal Aura Beach Resort & Spa features 366 luxuriously furnished standard and family guestrooms and offer centrally regulated air conditioning and heating systems. In addition to a private bathroom (shower, WC, telephone, amenities, hairdryer), in-room amenities include a safety deposit box (lap top size), Satellite TV, radio and music, as well as a mini bar and carpet-covered floors. Other features include a balcony, direct dial telephone, electronic card-lock system, wireless Internet connection and a fire alarm. Free baby cot is available on request. According to Turkish Law, the consumption of tobacco products is prohibited in the rooms.